Description: Stadium® has been bred exclusively to suit sporting venues. It has good density for sports fields and golf courses without massive thatch problems that hurt the performance of other couches in warm climates. Although it has good density, Stadium Couch is a low to moderate thatch Couch unlike highly thatch prone Couch varieties. It has very little seed head production, which greatly reduces mowing schedules particularly on golf courses. 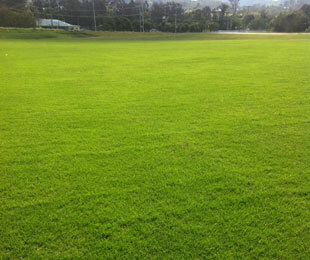 Its colour and texture is excellent, and its ability to look good even under somewhat adverse conditions makes it a good choice for high profile sporting facilities, or for the regular council oval. This sports turf is still going through testing to allow more information and discovery on where it works best and what it is best suited for. Uses: High profile sporting facilities including golf courses and council grounds. Position: Suited to warmer climates, including dry and hotter humid regions such as the area from Sydney to mid north Queensland. In cooler parts of Victoria it is too slow growing until the weather warms up. Cold tolerant down to -12°c. Recommended for up to 20% shade in areas with low wear and up to 15% shade in areas with moderate to high wear. Care: Mow regularly and fertilise once or twice a year.